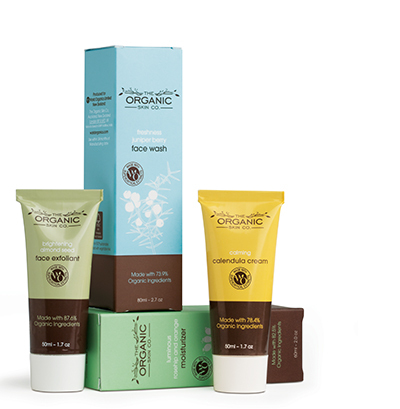 When it comes to eggs, there's nothing better than fresh, organic and free range. Unfortunately, to buy the best eggs you have to pay the top dollar. For this reason we kept a couple of chickens of our own for a few months, Pirate and Daisy. Our flatmate at the time, Tash Dalziel, set it all up while Paul and I were on holiday. Tash sectioned off a run along one side of our house and got two chooks from the Psychology Department of Waikato University. 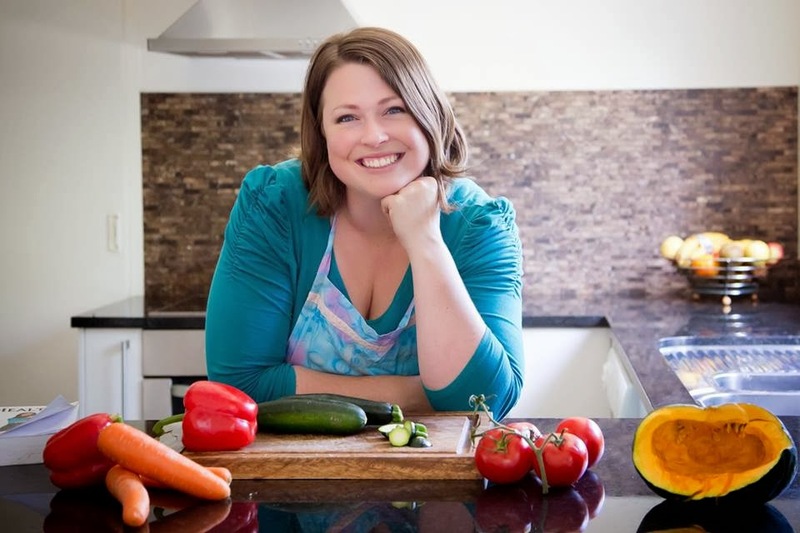 They weren't too healthy when she got them, having spent the past five years living in a concrete shed, but with a bit of fresh air, sunshine and vegetable scraps, they soon perked up. The most visible change occurred in their egg yolks, which became more golden as time went on. Unfortunately our small section meant that the smell was just a bit too close to home, literally, so we had to give them away. If we had a larger section, I would possibly consider giving it another go, although I did get a bit squeamish with all the poo, and it was annoying trying to keep them out of my vegetable garden, where they loved to dig up the soil, and any plants along with it. 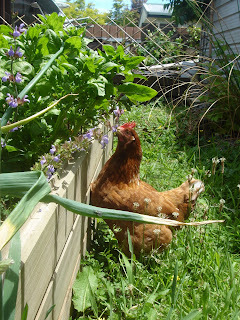 The next photo shows Daisy sneaking through the barrier I'd set up to keep her out of my potato patch. When I got pregnant with Lily, I really didn't want to be dealing with the chickens too closely, as I didn't want to pass on any bugs or diseases to her. And the chickens totally freaked Paul out. I think they took a fancy to him, judging by the fact they charged him anytime he went outside. However, while we had the chickens, it was a treat to get beautiful, fresh eggs most days. Side benefits included the fact that chicken poop is a great fertiliser for the garden, and that chickens love to eat snails, slugs and weeds. If you're keen to get chickens (and you can house them a decent distant from your home) just give it a go. We did, and we didn't have any of the fancy stuff. Tash built Pirate and Daisy's run out of chicken wire and posts. The main point of a run is to keep predators out. Cats didn't seem to be a problem (our cat Bonty was more scared of the chickens than they were of him), it's really dogs you need to worry about. So if you have a fenced off backyard, you could let the chickens run loose. If you're worried about your chickens flying over the fence and escaping, clip one of their wings. See here for instructions. 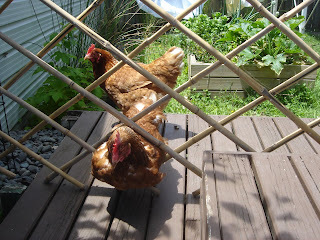 Within the run, you want somewhere sheltered for the chickens to get out of the midday sun, or the rain. You also need some kind of cosy home they can roost, sleep and lay eggs in. Tash made Pirate and Daisy's home out of an old office cabinet on stilts she bought from the Habitat for Humanity shop. 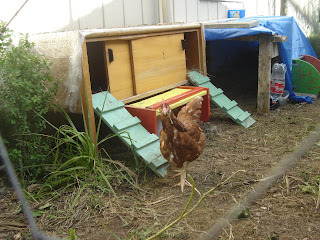 She built ramps up to the two sides of the cabinet so the chickens could easily climb up into their respective nests. The cabinet was too small to have perches inside it, we just lined it with shredded paper so the chooks could cozy up over night. To begin with we actually used straw bought from the pet shop to line their nest, but this was ridiculously expensive so Tash sourced huge bags of free shredded paper from our local supermarket instead. You could also use wood shavings or dried out lawn clippings (as long as they're free of chemicals). Change your roost filler material frequently (put it in your compost bin), especially if chickens have pooed in it or an egg has cracked and leaked into it. This is because bacteria can build up quickly and contaminate your other eggs. Whatever filler material you use, it shouldn't be dusty as hens can suffer from respiratory problems. Chickens seem to eat anything (just don't feed them chicken). Any leftover scraps or weeds, even the prickly ones. We also fed them chicken feed from the supermarket, and crushed up shell so that they produced eggs with hard shells. I've heard you can also bake their egg shells in the oven, and crush them up to feed back to them, or you can give them sand to peck at - the principle is the same. My sister has chickens and she keeps their food in a specially designed chicken feeder that has a pedal the chickens stand on to open. This keeps out rats and other small birds. It also holds a lot of meal, so you only need to refill it every week or two. The chicken feeders are quite expensive, so we just used big plastic containers. Long-term I think we would have invested in one of the proper chicken feeders. All the websites we looked at said chickens need fresh water daily, but we found that they drunk it even if we didn't have time to change it. Although, Pirate and Daisy did like to kick and scratch at the ground, so their drinking water often ended up full of dirt and weeds, and then they wouldn't drink it. My sister's husband has run guttering along the roof of their chicken house and this feeds rain water into a small plastic tank the chickens can drink from. To have the freshest eggs, try and gather them at least once a day, and keep them cool after they are gathered. Also, don't keep reusing the same egg cartons as bacteria can build up and contaminate your fresh eggs. Try the Chicken Rescue Network. It's a non-profit organisation with the mission of helping unwanted New Zealand chickens find new, caring homes. Many other countries have similar organisations. Or, if you're in the Waikato, you could also try contacting the Psychology Department at Waikato University. Their chickens are special. They know that if they peck the blue button, they get food, but if they peck the red one, they don't.